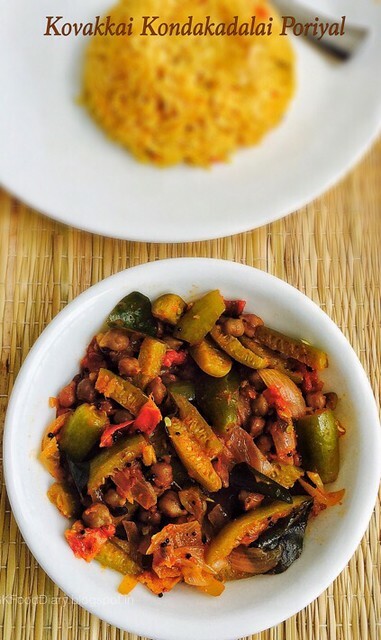 Kovakkai/Ivygourd/tindora is a healthy veggie and will be in our menu at least once in two weeks. I usually make this simple kovakkai poriyal. 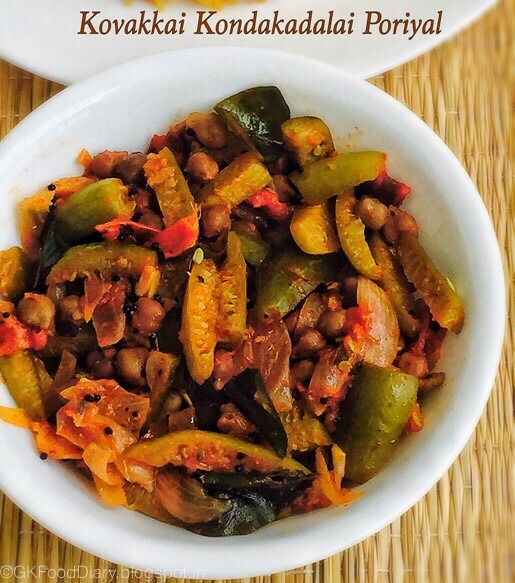 This kovakkai kondakadalai poriyal is more healthy with the addition of kondakadalai/black channa/chickpea. It is very simple to make, tastes so good and definitely a keeper recipe. 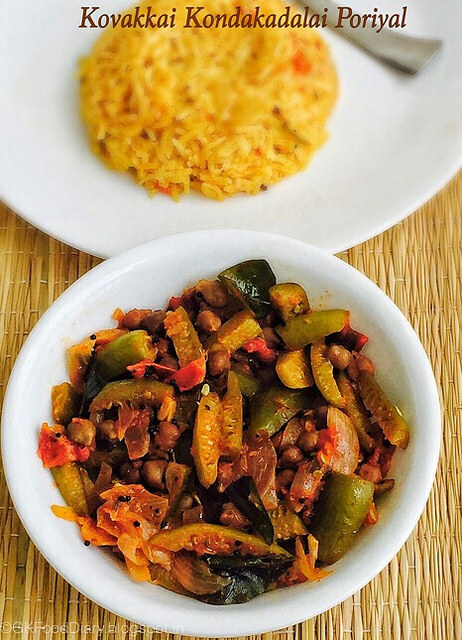 This poriyal recipe is apt for diabetic patients as the kovakkai & black channa are known to control the blood sugar and also there is no coconut added. 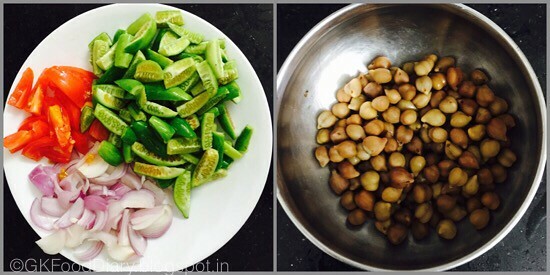 Let’s check how to make this healthy kovakkai kondakadalai poriyal. Wash the kovakkai well in running water and chop them length wise into thin strips. Chop the onion and tomato lengthwise and keep it ready. Pressure cook the black channa in a cup of water for 6 whistles. Set aside. Heat a pan with oil and add the items to temper. 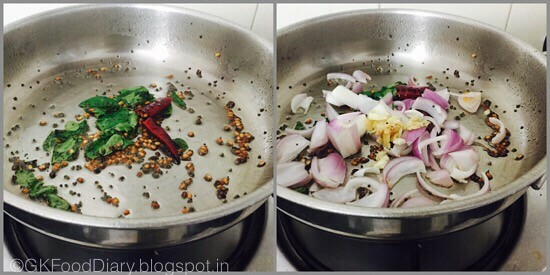 Once mustard cracks and urad dal turns brown, add curry leaves & red chillies. Fry for a minute. Now add the onions along with ginger garlic paste and sauté till onion becomes transparent. Then add chopped tomatoes and sauté them until soft and mushy. Once the tomatoes are cooked add chopped kovakkai along with turmeric powder, red chilli powder, corainder powder and salt. Mix well. Add water till it immersing level and cook covered in medium flame until the kovakkai is completely cooked. This may take 10 to 12 minutes. Kovakkai will be soft and transparent once cooked. 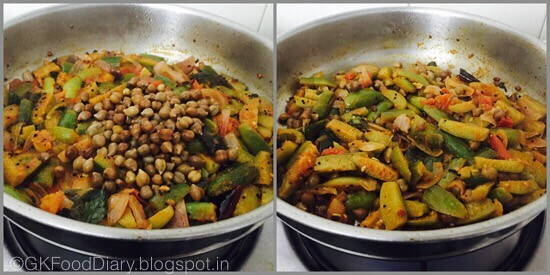 After the kovakkai got cooked, add cooked black channa and mix well for 2 minutes. Once everything comes together, switch off the flame. 1. Wash the kovakkai well in running water and chop them length wise into thin strips. 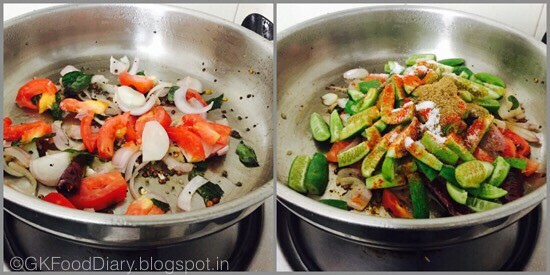 Chop the onion and tomato lengthwise and keep it ready. Pressure cook the black channa in a cup of water for 6 whistles. Set aside. 1. Heat a pan with oil and add the items to temper. Once mustard cracks and urad dal turns brown, add curry leaves & red chillies. Fry for a minute. Now add the onions along with ginger garlic paste and saute till onion becomes transparent. 2. Then add chopped tomatoes and saute them until soft and mushy. Once the tomatoes are cooked add chopped kovakkai along with turmeric powder, red chilli powder, coriander powder and salt. Mix well. 3. 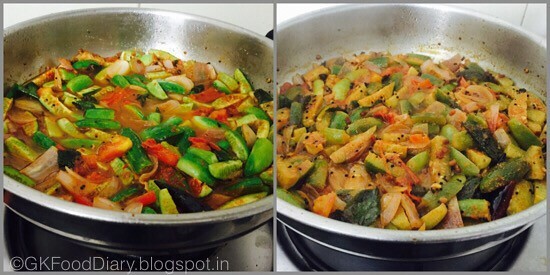 Add water till it immersing level and cook covered in medium flame until the kovakkai is completely cooked. This may take 10 to 12 minutes. Kovakkai will be soft and transparent once cooked. 4. After the kovakkai got cooked, add cooked black channa and mix well for 2 minutes. Once everything comes together, switch off the flame. The Healthy kovakkai kondakadalai poriyal is ready! Serve with hot steamed rice & any Kuzhambu of your choice. We had it with tomato rice. 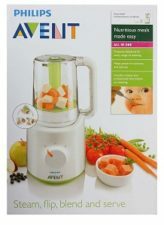 Kovakkai takes time to cook. You can pressure cook it for a whistle and add it. But be sure that they don’t become mushy.